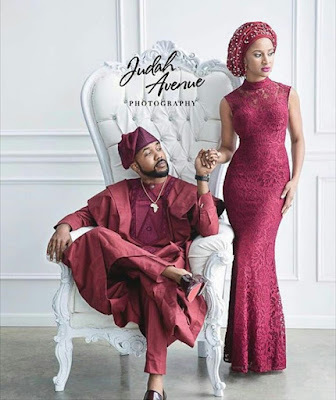 The Orabella's Blog...: Lovely Photo of Banky W and Fiancé and Question of The Day! Lovely Photo of Banky W and Fiancé and Question of The Day! I coiled this brief story line from a talented actress and producer Instragram page, Regina Chukwu. The story got my attention with a lot of answers airing their view, hence I decided to share with you fans! "A man wants to marry from his village. He lives in the city so he sent some money to his father to help him find a good girl to marry (all he wanted was a good village wife) he trusted his father to make a good choice. The father did as expected , took all the necessary steps as tradition required. Now he decided to send the bride to her groom in the city. He sent her off with the address of his son but she arrived the city late, getting a taxi to the indicated address was proving difficult, just then a car pull up and offered to give her a ride, one thing led to another and they both ended up in an hotel room, spent the night together nd the next morning they went their separate ways. The question is; if you were the man or woman how would u react?" Meanwhile, who is loves this Banky W and Fiance, Adesua Etomi picture? They look good together. We all can't wait for the big day.